1957 marked the start of not only TAE and IGY, but also the beginning of exploration of the Transantarctic Mountains by NZ geological and survey parties travelling by dog sledge. Over the following eight seasons they covered most of the 1,800-km-long section within the Ross Dependency between Cape Adair and the Axel Heiberg Glacier. 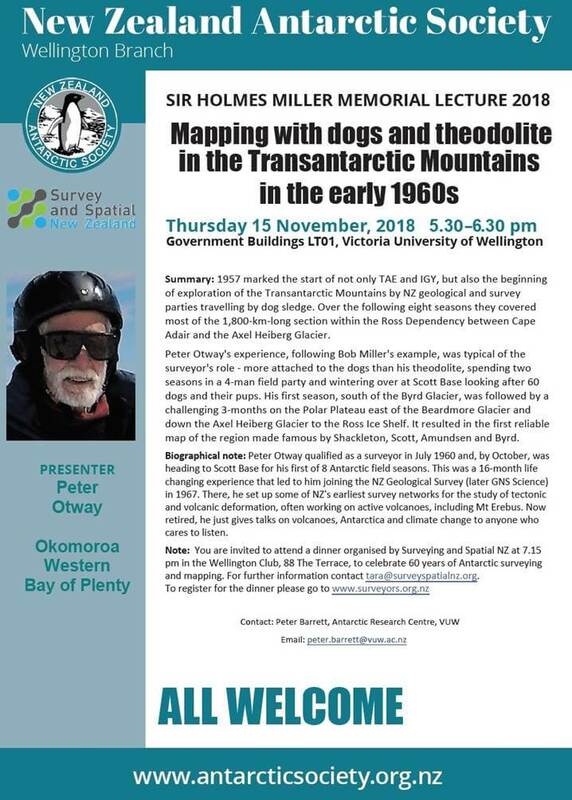 Peter Otway’s experience, following Bob Miller’s example, was typical of the surveyor’s role – more attached to the dogs than his theodolite, spending two seasons in a 4-man field party and wintering over at Scott Base looking after 60 dogs and their pups. His first season, south of the Byrd Glacier, was followed by a challenging 3-months on the Polar Plateau east of the Beardmore Glacier and down the Axel Heiberg Glacier to the Ross Ice Shelf. It resulted in the first reliable map of the region made famous by Shackleton, Scott, Amundsen and Byrd. Biographical note: Peter Otway qualified as a surveyor in July 1960 and, by October, was heading to Scott Base for his first of 8 Antarctic field seasons. This was a 16-month life changing experience that led to him joining the NZ Geological Survey (later GNS Science) in 1967. There, he set up some of NZ’s earliest survey networks for the study of tectonic and volcanic deformation, often working on active volcanoes, including Mt Erebus. Now retired, he just gives talks on volcanoes, Antarctica and climate change to anyone who cares to listen. Note: You are invited to attend a dinner organised by Surveying and Spatial NZ at 7.15 pm in the Wellington Club, 88 The Terrace, to celebrate 60 years of Antarctic surveying and mapping. For further information contact tara@surveyspatialnz.org.